Irrespective of technical abundancy, RE potential per se does not imply a structural and inclusive expansion of energy access and an overall sustainable energy development of EA. Proper technological, economic, institutional, and policy considerations must be made to assess which are the best ways and most apt policies to sustain the exploitation of such potential in the regional context in relation to other energy sources, as well as which roadblocks and challenges are faced. A first meaningful consideration in this sense is that EA is characterised by a strong rural-urban imbalance: the majority of the population lives in poorly interconnected rural communities away from the electricity grid, which serves predominantly densely populated urban centres. While plans to tackle the imbalance are in place in virtually every country (both Kenya and South Africa have achieved notable results in this sense), the issue is not going to be structurally overcome rapidly. Thus, as highlighted by the least-cost electrification scenarios in Chap. 4, when discussing the case for renewables to increase and improve access, a distinction must be made between national grid expansion to reach additional shares of the population, and specific decentralised solutions. In turn, considerations on which solutions are the most cost-effective in each region, which level of power supply is taken as short-term target, which lifetime decentralised options can expect (e.g. before the grid reaches that area), which costs profiles they present (including post-installation and maintenance costs), and which are the most apt policies in such different contexts must be made. RE potential deployment also presents financial and governance issues both on the supply and on the demand-side, with the channelling of private investments being a necessary condition along with the establishment of effective business-to-consumer (B2C) models to ensure consumers are willing and able to pay for energy services. Moreover, irrespective of large technical potential, renewables alone cannot fulfil all energy needs due (1) intermittency issues and generation fluctuations and (2) non-electric needs by the residential, industrial, and transport sectors. Concerning the first question, round-the-clock power availability requires renewables being complemented by other sources (e.g. through thermal generation at demand peaks) and sustained by storage technologies (for instance with batteries or pumped-storage hydropower) within a sound policy framework. On the second, questions relating to clean cooking and the substitution of solid biomass with liquefied petroleum gas (LPG) and to the exploitation of NG resources to empower the industry and transports in the region are deemed significant. In this context, five key intervention dimensions are discussed: technological issues, economic considerations, transboundary cooperation, policy, and financing challenges. The main questions touched upon within each cluster are reported in Table 5.1. The discussion is tailored to the specific situation characterising the context of EA, for which relevant experiences and policy cases are reported. Chapter 6 then discusses the role of NG both alone and in relation with RE, and the potential for LPG penetration. As observed by Fouquet (2016), “energy systems are subject to strong and long-lived path dependency, owing to technological, infrastructural, institutional and behavioural lock-ins”. Particularly during the industrialisation and development phases of a country, where flexibility is large and investment in hard assets is heavy, policymakers face the responsibility of carefully considering all implications before directing their economies onto certain energy pathways. For instance, rapid development pathways with a high energy and carbon intensity are prone to be detrimental to their long-run prosperity despite tackling short-run issues. In particular, economies of scale, as well as learning and network effects (determining decreasing marginal cost with increasing installed capacity of a given technology) pave the way towards energy mixes which are not necessarily socially optimal over the long-run. Furthermore, there is a feedback mechanism between energy resources, infrastructure, and industrial development, locking an economy into specific consumption patterns. The case of coal in South Africa is emblematic in this sense. The country is one of the top world’s producers and exporters of coals, which is also used in 90% of its domestic power generation (RISE 2017), with almost 38 GW of installed coal-fired capacity with just around 35% of efficiency (Sloss 2017). Many South Africa’s power stations are in the surroundings of a coal mine, from which these are directly supplied with fuel. Coal is also liquefied to satisfy around a third of the domestic demand for liquid fuels by Sasol company (Höök and Aleklett 2010). On the one hand, this setting has been the key driver to the energy independency of South Africa and the rapid expansion of electricity access thanks to cheap domestically mined coal, although recently prices soared. On the other hand, it has rendered the country the 16th world emitter of carbon dioxide, with 0.4 Mt in 2015 (Netherlands Environmental Assessment Energy data) representing alone 1.16% of the global fossil fuel CO2 emissions. This is striking, especially if compared with the fraction of South Africa’s GDP over the global figure, which stands at 0.43%, determining one of the highest carbon intensities of GDP in the world. Also, local pollutants emissions must be factored in, with fossil-fired generation in the country being responsible of large shares of the total SO2 and NOx emissions (up to 75% in the Highveld region, one of the key mining areas in the country), resulting in major social costs in terms of air pollution and health impact. Moreover, proven reserves have been significantly decreasing throughout the last 40 years (Fig. 5.1), and as of 2017 they stand at 10 Gt, determining growing concerns for both the domestic energy mix (which has started a massive process of diversification with the displacement of some old-generation coal-fired plants) and the economic growth prospects. While coal is and will continue to be a very significant energy source for the country in the coming years, it is clear that having put in place an energy system that is almost entirely dependent on it is nowadays raising environmental and economic issues. Thus, virtually all EA countries (which are either not particularly richly endowed with coal or that find themselves in a critical juncture for their energy development pathway) might undergo significant risks if they invest heavily in coal-fired generation capacity. This is true even if in many instances coal-fired generation currently is the one with the lowest short-run LCOE. Significant economic repercussions could be witnessed by such countries as a result of changing prices (Fig. 5.2)—especially if coal is imported—and environmental and health impact in the following decades. The introduction of a global carbon tax—raising the global price of embedded CO2 and thus of imported coal—is a further risk borne by countries setting up a coal-fired energy development plan. Upon these considerations, policy makers should carefully consider electrification plans and the means selected to achieve results in their BCA, paying attention not to discount the future disproportionately, i.e. disregarding large future costs despite present benefits. The large-scale set-up of fossil-fired plants to provide baseload power is a relevant example, with future costs accruing from price uncertainty, import dependency issues, as well as climate and health impact. On the other hand, modern RE should be considered by policymakers even though its LCOE (levelized cost of electricity) is higher than other alternatives when the project is drafted, or despite higher upfront deployment costs. RE sources present in fact long-term benefits and steep learning curves (Creutzig et al. 2017; IRENA 2018), with the achievement of energy independency being a major long-term benefit. A challenge for the realisation of RE potential is thus the proper planning of energy development, and thus the avoidance of short-lived investments which would become economically inefficient during their planned lifetime. Overall, infrastructure projects must be carefully designed and their effectiveness in the coming years under different scenarios (i.e. their resilience) must be assessed: if wrongly timed, unevenly spread, or poorly managed, they would eventually foster inefficient outcomes, distributional issues, and long-lasting public debt. Thus, government should carefully consider future investment, weighting pros and cons of large grid-connected projects against those of small and localised ones. At the same time, they must consider how their decision will affect the future path-dependency of the energy system; the potential risk from resources associated with a particular generation technology1; scale and network dynamics; expectations about changing costs profiles and technological advances; as well as proper ways to complement the current limitations of generating electricity from modern renewables. Decentralised solutions demand specific technical considerations. First, policymakers should make projections of where, if, and when the national grid will reach currently non-electrified areas and thus support different RE-backed plans in different areas. Promoting off-grid household-level options or a village-level mini-grid may be inefficient if the grid is to be extended in a short time span, thus resulting in generation capacity redundancy, unless a proper plan to connect decentralised systems to the grid itself are set up. Conversely, where economic and landscape constraints are deemed too heavy, decentralised solutions should be promptly fostered. Second, the tier of electricity (expressed e.g. by the kWh/year/household consumed) set as a target where the grid is not under reach is another significant technical decision with deep political implication. The type of off-grid and mini-grid infrastructure installed determines the resulting income generation potential among small businesses, as well as the maximum number and power of the appliances owned by different households. It is on this basis that the World Bank and other agencies proposed a “multi-tier framework” to define energy supply levels (Bhatia and Angelou (2015). Figure 5.3 report a schematic framework of the means of electrification and their possible uses produced by the International Energy Agency. Off-grid solutions include in fact a large spectrum of options, and it is arguable that their scale (power output) and usability (e.g. whether or not devices include a storage unit to use power overnight) define the impact they can have on development objectives. The results of the least-cost electrification in Chap. 4 showed that in order to achieve electrification tiers between 423-160 kWh/person/year and 160-44 kWh/person/year in urban and rural areas, respectively, 41% of the total capacity additions would be represented by mini-grids (mostly PV-powered) and 8.5% by standalone systems. Such figures give an idea of the relevance that decentralised solutions could have in the context of EA, and thus of why proper supporting policy is necessary to enable their deployment. Last, concerning storage, technical and economic questions of cost shifting are deemed relevant. While mini-grid and off-grid solutions are in fact in many cases already the most cost-effective way to provide energy access to rural populations in EA countries, storage solutions that could enable round-the-clock power availability are still lagging behind in terms of their penetration. As referred by Bart Boesmans, chief technical officer for ENGIE Africa (a French energy company with a longstanding presence in the continent), “based on the current costs of the storage technologies, it would be preferable in the short term to focus on hybrid power projects and minigrids” (Renewable Energy World 2017). Solar generation in tandem with gas turbines offers a possible solution: if extra power is needed for only a fraction of the day, the business case changes significantly. Furthermore, it has been argued that utilities making a business plan to develop a fossil fuel-based generation solution prospected to come on-line in 5-year should compare their business costs with that of energy storage solutions over 5 years to assess the economic sustainability of the project. This remarks the significance of long-term decisions in energy planning, with PV already competitive with fossil-fired generation and storage costs being the only effective determining factor. Figure 5.4 depicts, for different battery solutions (including new and emerging technologies), the current cost and the forecasted potential for cost reduction by 2030. IRENA (2017) remarks that the cost of Li-ion batteries for transport application has fallen by a striking 73% between 2010 and 2016 for and that in some high-income countries the cost of stationary applications of such storage option has also dropped significantly. The authors of the report forecast that the cost of such batteries could decrease by a further 54–61% by 2030, owing to both economies of scale and technology improvements across the manufacturing value chain. Furthermore, flow batteries, which have the benefit of being able to independently scale their energy and power characteristics, could also offer large cost reduction potential. In addition, hydropower could also play an enabling role for the increased penetration of renewable by serving as a clean storage solution. This could be the case through the development of pumped-storage facilities, which store potential from other variable RE (such as solar and wind) by using excess power to pump water in a reservoir upstream, which can be later released down to a dam when peak power is required. As of 2018, only four pumped-storage facilities are under operation throughout SSA, all in South Africa, while according to the International Hydropower Association two have been announced in the Kingdom of Lesotho. In the future the technology (currently the only mature and largely adopted utility-scale energy storage option) could gain increasing relevance in EA, also thanks to the possibility of transforming existing reservoirs to pumped hydropower schemes (Fitzgerald et al. 2012). As evidenced in Fig. 5.5, pumped-storage might then lead to a decoupling of fossil-generation to satisfy peak demand, and thus to a mitigation of potential GHG emissions. For instance, Murage and Anderson (2014) propose the cooperation between the large Lake Turkana wind farm and a hydro-pumped storage facility in Kenya. The authors argue that diurnal wind patterns in the region exhibit negative correlations with load patterns, and thus storage would render energy more reliable (reducing the system’s total power output shortage by 46%) and increase the expected daily revenue of the wind farm by 10,000+ USD. In Mekmuangthong and Premrudeepreechacharn (2015) the combined operation of a PV plant and a hydro-pumped storage facility is analysed, and the authors find that operating the system across an inter-seasonal cycle results in energy and economic gains. Furthermore, as discussed by Castronuovo et al. (2014), the introduction of intermittent RE (such as wind or solar energy) in isolated systems can be more complex than it is in large interconnected systems, because VRE plants are generally unable to assist in maintaining the frequency and voltage of the system within tight margins. Thus, also in this case storage devices can perform an important role in balancing the amounts of power and energy in the system. Results from different studies, for instance on the integration of isolated wind-PV systems and pumped storage, or in hybrid diesel-RE systems, show that the implementation of storage facilities considerably improves the scope of serving the energy needs of remote communities (Abbey and Joos 2009). However, it must be noted that pumped-hydropower is a mature technology with site-specific cost (IRENA 2012) and thus there is little potential to structurally reduce the total cost from a technology perspective. Moreover, pumped storage involves large infrastructure and is not as scalable and modular as some of the emerging battery electricity storage technologies. 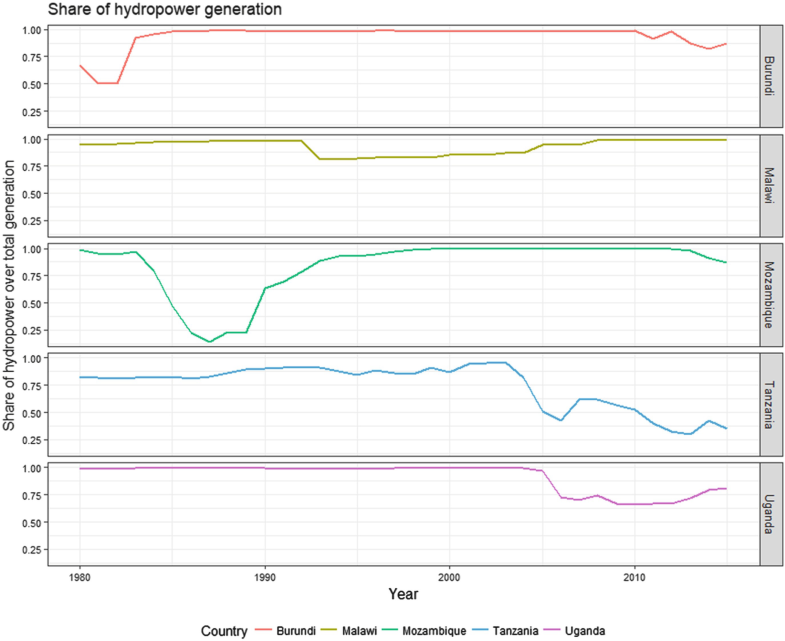 Another crucial technical consideration in the context of EA concerns the long-lasting situation of hydropower dependency found in Burundi, Malawi, Mozambique, Tanzania and Uganda (see Fig. 5.6 reporting the evolution of the share of hydropower generation over total generation). These countries are currently vulnerable to water level fluctuations and future permanent changes in precipitation patterns and potential evapotranspiration levels. An increasing number of disruptions has already been witnessed over recent years due to the impact of different emerging stressors, all of which are expected to gain further significance. These include a rapidly and steeply growing population, coupled with an increase in per-capita water consumption levels associated with economic growth. Together with climate risks, these developments might jeopardise the energy security if no diversification is accomplished. To mention some examples, Malawi’s hydropower capacity factor has fallen below 50% in 2015 and 2016 (authors’ elaboration on IRENA 2017), with a generation of 1176 GWh in 2015, well below the 1800 GWh of 2010, despite a 18% increase in installed capacity over the same period. The water level of Lake Malawi has been in fact reported to be in a continuous negative trend since 2008 (USDA satellite altimetry 2018). Tanzania’s hydropower output has also been far from constant, and the national power sector has faced severe disruptions in recent years, the worst of which was the drought of October 2015, which led to the idling of the entire hydropower capacity of the country. These fluctuations and the role of extreme events are identified in the literature as having substantial adverse effects on both total factor and labour productivity of small and medium enterprises (Conway et al. 2015; Occhiali 2016), as well as on overall development. Concerning predictions for the future of hydropower, scientific works on the expected long-lived impacts of climate change on the average hydropower availability finds mixed and highly uncertain evidence for EA (Turner et al. 2017). Nonetheless, a high level of confidence is instead expressed over the fact that climate change will heavily skew seasonal and decadal precipitation patterns, with an expected rise in the frequency and intensity of extremes (including hydrological droughts and floods), as well as increasing temperatures and thus higher levels of potential evapotranspiration (IPCC 2015). In this setting of uncertainty, diversifying the power mix and exploiting the untapped potential of different RE resources such as solar and wind power, as well as cleaner fuels like NG where this is available and economically viable, is pivotal. Hitherto only Tanzania seems to have effectively undertaken a consistent process of diversification of its power generation mix. Moreover, investing in building hydro infrastructure that is resilient and adaptable to different water availability level and power demand scenarios is of great importance. For instance, installing multiple turbines of different sizes in new hydropower plants could allow dams to operate more efficiently over a wider range of discharge quantities, thus improving the downstream flow regime, minimising generation reduction and thus revenue loss, and guaranteeing more resiliency with respect to the uncertain future hydrology (Fig. 5.7). The first concerns the on-grid/mini (off)-grid trade-off faced by public decision makers in their investment or subsidisation decisions. The concrete question is where the economically optimal geographic boundary between the two alternative solutions lies across different contexts and locations. The second regards the status quo of demand being constrained by a limited supply in many regions of EA, due both to a growing population and to the fact that ability-to-pay and willingness-to-pay for electricity services are systematically lower than market prices for most off-grid appliances (Grimm et al. 2017). The third point follows an argument put forward by Deichmann et al. (2011), i.e. “how the configuration of cost-effective energy supply options will change in the future as technical change lowers the cost of RE sources, or as premium values for clean technology change relative fuel prices”. With reference to the first issue, Fig. 5.8 presents a schematic representation of the optimisation problem faced by public decision-makers. Off and mini-grid RE-based solutions only become competitive where the distance from the grid is such that an expansion of the existing grid is inefficient. The levelized cost of electricity is a convenient metric for comparing the two alternatives, with distance-cost curves plotted according to idealised cost profiles, reflecting a commonly lived situation, rather than any geographically-determined setting (Deichmann et al. 2011). The curves could indeed have different shapes in some settings, but this idealised framework is used to formalise a very frequent scenario with which policymakers in EA have to deal. The marginal cost of grid expansion slopes upward, because new fixed investments in hard infrastructure are reaching progressively fewer and fewer consumers as the system expands in remote areas with lower population densities, more complex terrains and greater institutional constraints (IEA 2017a). In first approximation, the least-cost mix of centralized and decentralized power can be thought to depend on the cost of grid expansion, which is determined among other things by geography (Parshall et al. 2009), and by the relative cost of locally available energy sources (Mentis et al. 2017). 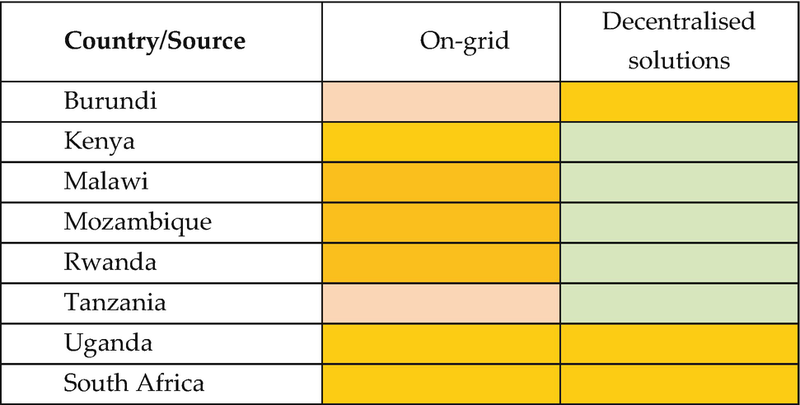 Estimated unit costs of grid extension in Sub-Saharan Africa range between $6340/km in densely populated areas to $19,070/km in remote rural provinces (UNIDO 2017). For instance, on average it costs Tanzania’s national utility TANESCO $2300 to extend the main grid to a rural off-grid household due to the high cost of running high voltage lines out to remote areas (standing at over $30,000/km for >66 kV transmission lines). Such high costs—usually borne by Governments—also have the side-effect of preventing investments in new transmission capacity. Conversely, the mini-grids could bring access to the same household for $500—$1000 as a result of cutting out high voltage lines. While access with on-grid and mini-grid is not equivalent, electricity provision per se, even at low levels of per-capita consumption, can pay a substantial role in breaking energy-poverty traps and fostering development, employment and poverty reduction (see empirical evidence in Dinkelman 2011; Khandker et al. 2013). In this sense, bridging private capital would also reduce the burden on the national governments, which would incur in less subsidy payments. According to IRENA (2016), the installation cost of stand-alone solar PV mini-grids in Africa is as low as $1.90/W for systems larger than 200 kW. At the same time, solar home systems provide the annual electricity needs of off-grid households for as little as $56/year. Besides marginal costs, there also exists an issue of grid resilience. Mini-grids with battery storage and local distributed generation are in fact typically more resilient than those that rely on extensive transmission lines, especially through forested landscapes. According to IEA’s (2017b) New Policies Scenario,2 main grid extension would serve half of all newly connected households in the entire SSA by 2030. This result is highly consistent with the results of the scenario analysis carried out in Chap. 4, which results in a median share of grid capacity additions of 50%. Always according to the IEA, in rural areas decentralised power systems would instead be the most cost-effective solution for more than 65% of those who will gain access. Previous multi-scenario spatial optimisation analysis for SSA [such as in Deichmann et al. (2011) and Mentis et al. (2017)] seem to suggest that—above very low consumption levels—decentralised solutions would be the lowest cost option only for a minority of households in SSA, i.e. that the optimal geographic boundary is rather remote from the main grid, even when potential future cost reductions of decentralised solutions and the costs of transmission and distribution infrastructure of grid-based electrification are considered. While our results agree on the modest share of standalone PV and diesel solutions, we find that mini-grids (and in particular PV) are a viable way to provide access with medium tiers of electricity consumptions which allow to avoid mass investment to extend the national transmission grid, at least in the next 10–15 years. Previous stories of mass electrification, such as the case of India, where over 99% of those who have gained access since 2000 have achieved it as a result of grid extension, are interesting in comparative terms. However, it must be noted that the mean population density of India is much higher than that of EA, allowing grid expansion to target on average a higher number of new potential consumers. Conversely, it also seems that there has been no universally effective strategy for boosting electrification rates in recent years, reflecting the broad diversity of energy resources, infrastructure, institutions, population density and distribution, and geography across regions and countries in the world. The need to set the national and regional fuel mix on a low-carbon trajectory, especially in sight of the steep regional population growth, makes large-scale grid connected renewable projects such as solar thermal power and large wind farms particularly relevant. Note that from the household perspective the two alternatives (on-grid access and off-grid back-up solutions) may well be seen as complements rather than mere substitutes, since individuals and small firms can be reluctant to rely exclusively on poorly managed central utilities with interrupted-supply issues, or because they may simply want to hedge subsistence economic activities and small enterprises from outages or volatile prices. 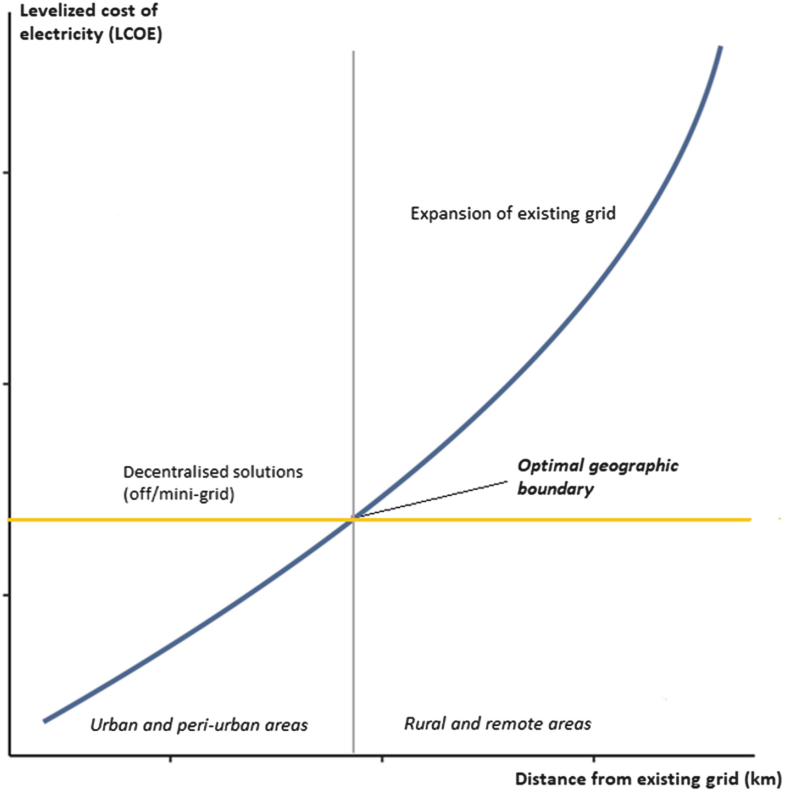 Overall, from a policy perspective, on-grid investments could initially be concentrated on certain prospective regions with high business potentials or industrial zones to which firms might relocate, while mini and off-grid technology could be used as a complement to promote energy security and development means to more remote areas. The limited amount of energy that off-grid technology is currently capable of producing renders it challenging to serve an array of different energy needs (including industrial uses), and it requires additional capital investments e.g. for storage. Thus, an integrated on-grid/off-grid mixed strategy would enable the development of industrial and service sectors, and at the same time achieve broad household and rural enterprises access to electricity at relatively low cost. With regards to the demand-side issues of electricity markets, the numerical results of a recent RCT-based study for off-grid PV appliances in rural Rwanda carried out by Grimm et al. (2017) provide relevant insights. The field experiment found that estimated willingness-to-pay (WTP) for different typologies of appliances in villages where the grid is missing are all clearly below the respective market prices, with elicited values ranging between 38 and 52% of the latter. Despite being only a case-study with a limited external validity, the experiment highlights that if electrification efforts are to be successful in remote rural areas of EA, an approach based on private market alone is unlikely to reach the broader population. Off-grid technology requires public subsidies, otherwise in all likelihood there will be a lack of demand at market prices, also because the alternative and currently predominant option of traditional biomass has no explicit price or cost to anchor on. Thus, it seems that offering a publicly-subsidised but privately-purchased alternative option to deliver off-grid electricity at the household level could be a way to render biomass collection and the related social costs at least more visible, and thus to reduce energy-derived externalities. While fundamental needs such as cooking are not easily and cheaply satisfied with off-grid electricity, the latter offers a chance for more productive uses of energy and thus a long-run prospect of economic development. Note that while public subsidies are of great importance, it has been argued (Moreno and Bareisaite 2015) that smarter payment schemes with longer payment periods, for example in the form of mobile-phone-based ‘pay-as-you-go’ plans, could also enable household investment into off-grid technology. A similar issue is also faced in areas that are within reach of the grid, but where households are credit-constrained and thus struggle to afford the high upfront connection costs, which often are well above their subsistence income. Thus, payment tools and policy can have a determinant role in unlocking households’ access in both off and on-grid settings (Table 5.2). The third question on the economics of RE deployment is the most problematic to address, because it concerns the dynamic nature of electrification investments and renewables infrastructure expansion, and in particular the uncertainty about future cost profile shifts. The issue has a twofold character: on the one hand, it refers to how technical change will affect the cost of RE sources and storage solutions. On the other, it is affected by how ‘premium values’ for clean technology will change relatively fuel prices, e.g. as the result of the introduction of a global carbon tax or due to shifting consumer preferences. Overall, this point concerns the question of how and to which extent the configuration of cost-effective energy supply options will differ from the current situation. 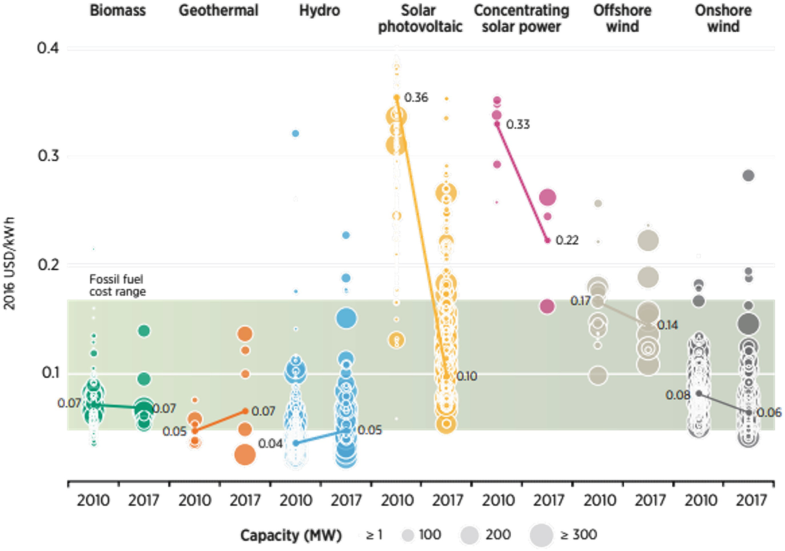 Figure 5.9, drawn from IRENA’s (2018) Renewable Power Generation Costs report, illustrates the change in the global levelized cost of electricity from utility-scale renewable power generation technologies between 2010 and 2017. The diameter of each circle represents the size of the project, while the dark band represents the fossil fuel-fired power generation cost range. 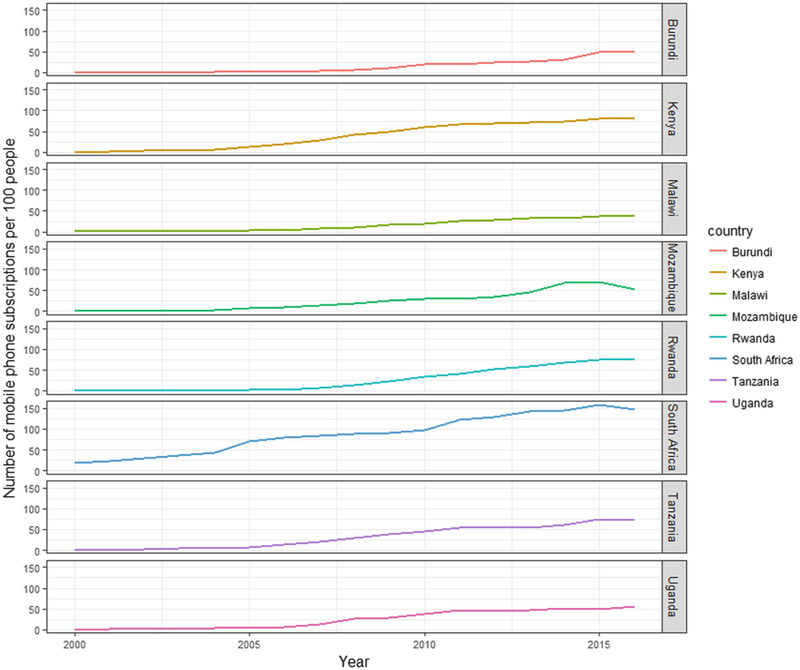 While the LCOE figures stem from a global-scale assessment, they provide a hint of the underlying global trends in the economics of power generation. In particular, they show that while fossil-fired generation is assumed to have remained at a steady LCOE, between 0.1 and 0.2 USD/kWh, solar PV and CSP projects have witnessed a steep fall in the average LCOE with a ~70% decline for PV and a ~30% drop for CSP. However, while the decision of developing a PV field now seems competitive with that of a fossil-fired plant, the current LCOE cost of CSP does not seem to be in the competitive range. Wind power also shows a declining cost trend, and now both onshore and offshore projects look like competitors of thermal generation. On the other hand, less significant shifts are witnessed for other RE options, with biomass, geothermal, and hydropower projects not having substantially altered their cost component over the last years. Overall, it is of utmost importance to consider the trends of the LCOE lines in the planning horizon of power generation projects in EA. Technology lock-ins and path dependencies should in fact be minimised with the adoption of resilient electrification plans capable of performing efficiently in an array of scenarios of future costs of energy and technology. In the context of expanding energy access in EA and promoting a sustainable (energy) development in the region, it is also worth discussing the role that strategic cross-country cooperation can play. Insufficient power generation is indeed not the only determinant of the current low supply and access levels in EA: the scarcity of interconnectors to trade energy resources and power across border is another leading explanation. Joint capacity additions, interconnected grids, and resource sharing could all play a major role in the achievement of a faster and more inclusive energy development and electrification process in EA. 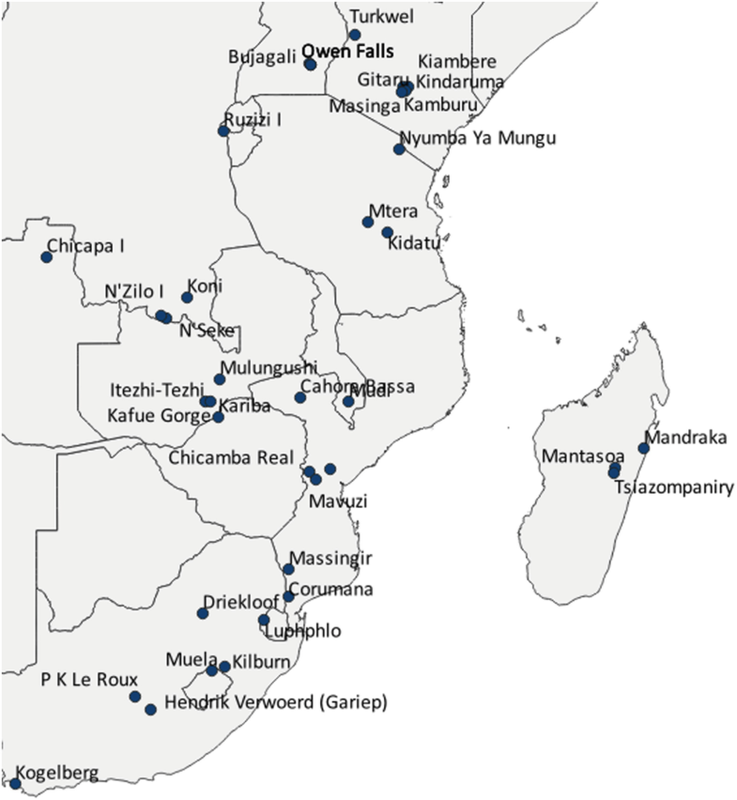 A range of bilateral agreements for power exchange already exists between neighbouring countries in EA, including the following grid connections (existing, currently under construction, or approved): a 400 kV South Africa-Zimbabwe line through Botswana (and, as of 2018, a plan to establish a second transmission interconnector boosting the wheeling capacity by 1500 MW); a 535 kV HVDC line between Mozambique and South Africa (used to export power produced at Cahora Bassa hydropower plant); a planned 400 kV line between Mozambique and Zimbabwe; two 400 kV linking South Africa to Maputo via Swaziland to power an aluminium smelter in Mozambique; a 110 kV mini-power pool formed by eastern DRC, Rwanda and Burundi managed by SINELAC; a 330/400 kV Zambia-Tanzania-Kenya-Ethiopia interconnection (with a memorandum of understanding signed in 2014 and the project, with expected completion date in 2021, currently at different phases of development in the three countries involved); a 132 kV Uganda-Kenya connection (set up in 1955), to be expanded to 300 MW in 2020 and 600 MW in 2025; a Rwanda—Tanzania interconnection project with capacity of 200 MW by 2020 and 1000 MW by 2025; a bi-directional 500 kV HVDC (2000 MW) Kenya-Ethiopia, with construction works started in 2016; Rwanda-Uganda are to be connected at level of border towns in 30 kV and 220 kV (general interconnector under construction); a 400 kV Mozambique-Malawi line with feasibility study phase completed; furthermore, the expression of interest for feasibility studies for a 400 kV interconnection between Uganda-Rwanda-Kenya was made in late 2014 (Fig. 5.10). However, regional interconnections have not been optimized in past decades, and furthermore they have often been affected by the failure to meet contractual obligations, partially due to the lack of a contextual coordinated planning for the expansion of generation capacity in past bilateral system interconnections projects (Expogroup 2017). With a coordinated and interconnected system, it is possible to make sure that the currently cheapest power is always consumed first. In the presence of excess capacity from one source or site it is possible to complement others by selling excess supply beyond the national borders and producing a win-win scenario. Furthermore, grid interconnections increase the market size, reinforcing economies of scale. Thus, interconnection of infrastructure can reduce price and supply risks and increase the attractiveness of the local market for foreign investors in the energy sector. Interconnections can also enable countries to optimize domestic energy resources and counterbalance seasonal or natural variability of renewables. Additionally, EA countries endowed with substantial gas resources, namely Tanzania and Mozambique, could increase their exports of either gas or power (or both) in the region, contributing to complement fossil resources scarcity and to cope with RE intermittency problem, while also boosting economic cooperation in other sectors through multi-party trade agreements. 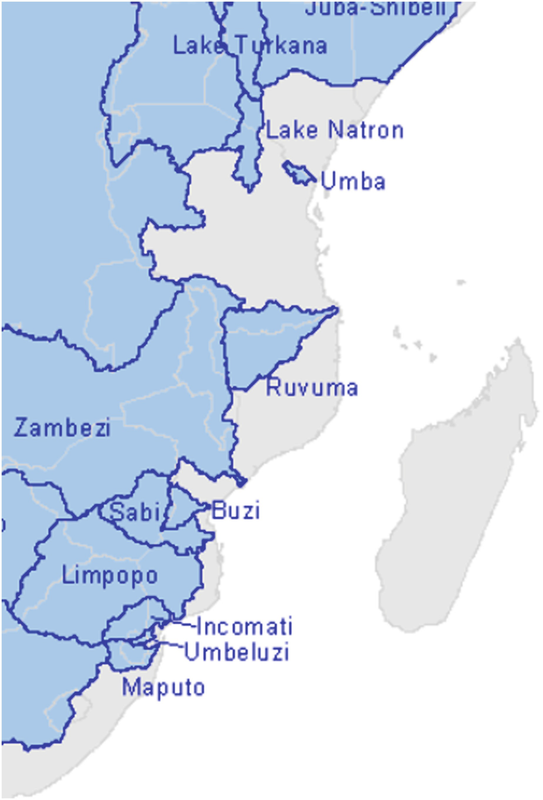 As a matter of fact, endowment heterogeneity is, at least in principle, a strong engine in boosting cooperation over boundaries in the region (although it could also lead to disputes over contested borders such as in the case of Malawi and Tanzania over Lake Nyasa’s fossil fuel resources). In particular, energy interdependency is likely to promote integration and could spill cooperation over into other areas, especially where permanent shared infrastructure is put into place. Achieving effective energy transboundary cooperation requires political will from multiple parties and converging economic interests. As of today, efforts in the region have culminated in the establishment of the Eastern African Power Pool (EAPP) in 2005, currently comprising 11 EA countries. The EAPP represents an ambitious attempt to achieve an “optimum development of energy resources in the region and to ease the access to electricity power supply to all people of the countries in the Eastern Africa Region through the regional power interconnections” (official mandate). In other words, it seeks to ensure increased power supply, reduced electricity production costs, and efficient transmission and exchange to ultimately establish a modernized electric market in EA. A regional master plan is being regularly updated to support the drafting of national power generation, transmission and export plans in EA countries. For instance, the Ethiopia-Kenya grid connection currently under construction was supported by EAPP, and its capacity (500 kV HVDC) is projected to be sufficient not only for the exchange between the two countries but also for future potential interconnections to other countries in the region (e.g. Tanzania). Nonetheless, as remarked by the Secretary General of EAPP, Mr. Lebbi Mwendavanu Kisitu Changullah (ESI Africa 2016), infrastructure financing is proving to be the main roadblock to the implementation of transboundary energy projects in EA. Furthermore, the reinforcement of the existing transmission network remains an equally important challenge. The large extent of the region and the non-homogeneity in the distribution of resources are further elements to account for in the formulation of transboundary projects in EA. In 2012, countries in the region began the Eastern Africa Integration Programme, aiming at the connection between the power grids of Ethiopia, Kenya, Tanzania, Uganda, and Rwanda in three phases. The first phase of the programme, connecting Ethiopia and Kenya, is under implementation. The (Tanzania-Zambia) TAZA project constitutes part of the second phase, with the other part—the Kenya-Tanzania transmission line—already under construction. In July 2018 Kenya and Tanzania secured more than $600 million in funding from international financiers for large-scale interconnection and power pooling (The East African 2018). The ultimate objective is the accomplishment of a regional Transmission Corridor Development project that will see Tanzania link the East Africa Power Pool to the Southern Africa Power Pool. This would guarantee the existence of a large competitive power market allowing to meet the energy security needs of the region in a cost-effective manner. The ability to engage in short-term trade, either bilateral or through existing market mechanisms in SAPP, will further enable countries to diversify their energy mix, eliminating the need for expensive emergency power during supply shocks, and improving conditions for the development of scale-efficient generation infrastructure selling to regional power markets. In this context, Tanzania would have a key role for its strategic position between the East and the South of the continent. For this reason, the country plans to boost power generation capacity from the current 1500 MW to 5000 MW over the next 3 years by building new gas-fired and hydroelectric plants, according to the country’s Energy Ministry. The sound management of transboundary RE (such as hydropower) and of fossil resources found near countries’ borders should underpin all future infrastructure projects. The EAPP, the EEP (Energy and Environment Partnership) and the other institutions and arenas where regional energy coordination takes place should constantly review the various players involved in the strategic energy planning across the region and update a plan that embeds current and future projects that have been proposed or already under consideration (Kammen et al. 2015). This would increase the overall efficiency of investments. Table 5.3 reports a list of currently operating organisations, institutions and frameworks devoted to energy cooperation in EA. It must also be noted that given the current situation of hydropower dependency and future capacity expansion plans, improving transboundary water resources management and within-country efficiency in water use among competing sectors is essential. A large number of transboundary river basins stream through EA countries (Fig. 5.11), calling for tight coordination to achieve optimal equilibria (Namara and Giordano 2017), since water availability downstream (and water infrastructure management) is largely affected by political and infrastructural choices upstream (Grey et al. 2016). Cooperative governance could in fact reduce water conflicts (and their spillage in other arenas including the power sector), increase efficiency in resource use—including hydropower output—and create added economic value by internalising potential negative externalities from uncoordinated action, boost investment and financing of shared water infrastructure (such as Pareto-efficiently located dams). The relationship between hydropower and rural irrigation in multipurpose reservoirs is also pivotal. Operations limited to individual dams are in fact prone to be insufficient to mitigate region-wide, river basins, and reservoir-level impacts, and balancing hydropower and other uses is likely to be most effectively achievable at wider scales. Thus, shifting away from single-project focus and leaning towards basin-level/regional and integrated approaches is suggested. Currently a complex regime exists in the regulation and agreements of transboundary watercourses. Table 5.4 reports a list of the local institutions (thus excluding international organisations and foreign authorities) active in different water resources management in EA. Figure 5.11 illustrates the location and areal extent of the major river basins in the region. There is extensive evidence that a high share of the energy projects commissioned in SSA countries (and in particular those involving RE) have witnessed failure, delay in delivery, or cost skyrocketing (Ikejemba et al. 2017). This is certainly a relevant consideration from which to start the discussion of the most fundamental policy aspects to be considered by public and private stakeholders involved in the energy sector of EA countries. Supporting policy for potential deployment is in fact of particular importance for the successful exploitation of RE. Irrespective of the heterogeneous resource endowment, key issues have similarly affected different countries, including the political agenda; the process of awarding projects to public and private companies; the financing mechanisms; stakeholder dialogue and co-operation; the planning and implementation dynamics; maintenance programs; as well as public inclusion. In this context, we review the current policies supporting energy investment and RE deployment in the EA countries under examination, while also discussing the key lessons learned and the policy challenges faced by public policymakers but mainly affecting private actors. It has been extensively discussed that in the task of assigning large energy infrastructure projects, competitive bidding promotes efficiency (Ackah et al. 2017). Nonetheless, until recently most SSA countries have used mostly non-competitive direct negotiation to procure additional generation capacity (Table 5.5). While in principle this could be perceived by public decision makers as a quicker option to procure infrastructure development, it has large potential negative effects. It is in fact prone to increase the final user cost of energy (since it does not incentivise cost-efficient solution), deter further private investment due to burdensome processes (where private and personal relationships affect public choices), and promote the allocation of licenses to companies that may not have sufficient capacity to deliver. On the other hand, countries that build tendering capacity and guarantee an open and competitive bidding process are more likely to attract large foreign and institutional investors with good financial and technical capacity. Concerning this latter point, Eberhard et al. (2017) characterised the growing contribution of IPPs in SSA by their reliance on long-term contracts with off-takers. In fact, development finance institutions such as the World Bank and the African Development Bank are playing an increasingly important role in attracting private sector interest, financing IPPs, and mitigating risk, in particularly due to their capacity to influence governments to honour commitments. However, for private investment in the energy sector to flourish, EA needs dynamic planning, linked to competitive procurement of new generation capacity. This must be accompanied by the building of regulatory capacity that encourages the distribution utilities that purchase power to improve their performance and prospects for financial sustainability. In particular, critical success factor for IPPs includes a range of both country-specific and project-specific factors. Furthermore, the presence of supportive policies during and after project implementation has proved to be very effective in guaranteeing returns on energy investments, with research and development playing a major role (Mas’ud et al. 2016). Note that not only local but also global policy setting is a determinant of success, because it has a direct impact on industrial and R&D sectors while also determining transfers of experience and knowledge (Pillot et al. 2017). The relatively young market for off-grid and mini-grid decentralised solutions has emerged as a much livelier and more competitive field than that for grid capacity additions and grid extension. The SA/MG market is indeed being populated by a growing spectrum of private companies, since it does not present the hard-fixed costs necessary to expand on-grid generation, which can often only be borne by Government utilities or large international developers. Thus, it has also been much more dynamic in terms of the pace of its growth and the degree of penetration, and it is one of the reasons why projections (Chap. 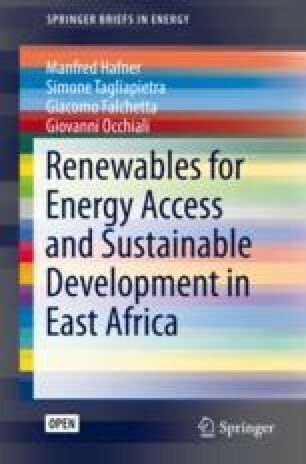 4 of this book; IEA 2017a, b; PBL 2017) suggest a relatively high degree of mini-grid development in EA in the coming year, with the rise of a coexistence between centralised grids and not interconnected MG and SA systems. Another policy measure that is proving successful in terms of the objective of increasing competition in the energy market is the separation of the management of state-owned power generation utilities (which in EA countries are all public and have constantly been in economic deficit) and the authorities responsible for the main transmission system. This aims at providing a level-playing field for IPPs and at increasing investment confidence. This separation has indeed already been implemented in Kenya or in Uganda, and it is taking place in Malawi. Table 5.6 reports the main authorities (including those responsible for generation, transmission, regulation, rural development and policymaking) involved in the power generation market of each EA country. In Burundi there is no competition in the on-grid market, and the power sector is vertically integrated. REGIDESO, the utility responsible for electricity generation and distribution, is entirely owned by the state. This makes sense, given the small size of the country, the very limited extent of the transmission (546 km) and distribution (337 km) grids and the relatively limited generation (263 GWh). Most of the potential to increase the currently extremely low electricity access rate (10%) lies with decentralised solutions, mostly because the bulk of the population (87%) lives in rural areas away from the grid. The country has a fairly developed legal and policy framework for mini-grids (updated in 2015), which allows private ownership and operation and establishes a duty exemption for PV array and modules and power generators. Although no mini-grids are yet in place, a project of 7 first mini grids in the Solar Electricity service with Mini Grids in Africa-Burundi (SESMA-Burundi) is at the feasibility study stage. In Kenya, a monopsony characterises the energy sector structure, with a single buyer (the Kenya Power and Lighting Corporation, KPLC) interacting with many would-be sellers (IPPs), determining a partially vertically unbundled energy market. In 2006 an ad-hoc electricity regulator was established (Energy Regulatory Commission), while in 2008 KETRACO (the Kenya Electricity Transmission Company) was founded as the transmission system operator, taking away such responsibility from KPLC. Private sector participation is found in generation (owning at least 10% of the total installed capacity and with at least six IPPs active in the country), while a bill was passed in 2015 (the Kenya Energy Bill) to establish a distribution licensee plan enabling any person in the licensee’s area of supply to receive a supply of electrical energy either directly from the licensee or from an accordingly authorised electricity retailer. With regards to the decentralised solutions market, mini-grid have been regulated since 2012 with licensing, stable-tariffs guaranteed and clear rules on interconnection. While no subsidies exist, duty exemptions are in place for power generators, energy storage systems and monitoring systems, and specific market financing facilities are available to support operators to develop mini-grid and stand-alone systems. In Malawi the power sector has long been characterised by a vertically integrated monopolistic structure, with ESCOM being responsible of generation, transmission, and distribution. In late 2016, the government completed the unbundling of the power sector, taking away from ESCOM the responsibility to manage power generation and establishing EGENCO to serve this purpose (Millenium Challenge Corporation 2017). Note that currently Malawi is not connected to the power systems of neighbouring countries and cannot therefore engage in power trading. Since 2007 an independent electricity regulator (the Malawi Energy Regulatory Authority) is controlling the power sector. Despite the recent partial vertical unbundling, competition in the generation sector is still very weak, although in 2017 the country has started opening the electricity market with a standardized power purchase agreement to allow IPPs to operate. Several IPPs are currently developing projects and more than 36 MoUs have been signed so far, the majority for RE projects. Mini-grids have been regulated since 2004 (Rural Electrification Act), they have a dedicated regulator and a dedicated team within the national utilities. Duty exemptions are provided for in the Customs and Excise Act 2014, and standardised PPAs with partially cost-reflective tariffs have been put in place to support the develop of stand-alone systems, while clear rules on their eventual interconnection have also been established. Mozambique is also characterised by a monopsony situation, with horizontal unbundling having interested only the generation segment, and the main player being the state-owned Electricidade de Moçambique (EDM), responsible for the generation, transmission, distribution and sale of electricity. EDM is however controlling only 20% of the country’s capacity, with the bulk of it coming from IPPs (after the publication of the Public-Private Partnership law in 2011) and, chiefly, from Cahora Bassa Hydro (owned by ESKOM South Africa, the Governments of Mozambique and Portugal). With regards to IPPs, the 2011 bill foresees that all of them must sell electricity to EDM and negotiate prices on a contract-by-contract basis, thus determining the monopsony. Currently, four IPP plants are operating in Mozambique, accounting for around 500 MW. Decentralised solutions are supported by FUNAE, the National Fund for Rural Electrification and they have been regulated since 1997. In 2018, CRONIMET Mining Power Solutions and MOSTE have signed a MoU with FUNAE to develop Mozambique’s first privately developed and financed mini-grid (expected to generate up to 200 kWp of solar power) on Chiloane Island, which will also be the largest pre-paid solar mini-grid in the country. Upon successful implementation of the Chiloane Island mini-grid, the consortium expects to develop a portfolio of 60 or more mini-grids across Mozambique. In Rwanda, the power sector has been recently unbundled, and a very large participation of IPPs is found in generation, which own 80% of the installed capacity. The Rwanda Electricity Group (REG), established in 2014 and entirely owned by the government, is the main electricity company. Operations are carried out by two subsidiaries—the Energy Development Corporation Limited (EDCL), which supports new capacity and transmission development both by itself and by IPPs, and the Energy Utility Corporation Limited (EUCL), operating transmission and distribution networks and selling the power. At the same time, Rwanda has one of the smallest energy sectors in SSA, with only 208 MW of installed capacity. Nonetheless, the country has an oversupply of on-grid generation and a backlog of contracted projects, and thus IPPs will not be able to secure permitting in the country until the roughly 200 MW of pipeline projects with existing PPAs are moved further into development. Currently, IPPs must go through the Rwanda Development Board (RDB) to start the process of developing new projects, before negotiating a PPA with EDCL and signing with EUCL. In the past, ~20 year “take-or-pay” PPAs have been signed, which compensate for full output of their project, and as a result have determined a situation where Rwanda has higher electricity tariffs than the EA average. However, all future IPPs must now participate in a competitive tender process, monitored by the Rwanda Utility Regulatory Authority (RURA). Moreover, the government has also introduced an array of policy instruments to render on-grid development attractive for the private sector, including tenders, unsolicited proposals and favourable tax regimes. These have drawn many private-sector players, and around 50 PPAs have been signed to date. Additionally, Rwanda has signed a 30 MW PPA with Kenya, but the transmission infrastructure has not yet been built. In Tanzania the key player in the power sector is TANESCO, the Tanzania Electric Supply Company Limited, which owns most of the country’s transmission and distribution network and more than half of its generating capacity. Currently, IPPs’ capacity share stands at 19.3%. However, TANESCO has outstanding debts with IPPs for close to 0.5 billion USD, due to the excessively low electricity rates. This has resulted in holding back investment in upstream capacity. Thus, the sector is still vertically integrated, and the Electricity Supply Industry Reform Strategy and Roadmap, which foresees TANESCO to be unbundled by 2025, was passed by the Government only in 2014. On the other hand, Tanzania has one of the most robust regulatory and legal frameworks in EA, encouraging the construction of small power projects. At end-2015, the second-generation framework was approved. This establishes that projects will earn a fixed tariff for the lifetime of the standardised PPA, instead of having annually fluctuating rates based on the distribution network operator’s avoided costs. The selection method will also vary by technology, with an administrative process for small hydro and biomass projects, and competitive bidding for solar and wind. At the same time, a lively environment has emerged in terms of off-grid energy providers, partially thanks to governmental subsidies for generation and storage. These includes grants for pre-investment activities, such as feasibility studies, environmental and social impact assessments, and performance grants for electricity connection, as well as duty exemptions for mini-grid systems. Tanzania is in fact a hotspot for the distribution of pico-solar lighting products and the development of mobile-based, pay-as-you-go business models for access to off-grid solar arrays. In Uganda the power sector has been fully vertically and horizontally unbundled in 2001, in so far that there are legally separate private companies at each segment of the pre-retail power system. However, a single-buyer (the Uganda Electricity Transmission Company Limited) situation persists, irrespective of a 60% IPP capacity share. Umeme is the key responsible for distribution, with a share of 98% of total Uganda’s electricity consumption. The bulk of the country’s generation comes from both hydro plants owned by the state-run Uganda Electricity Generation Company (UEGCL) and by the private IPP Bujagali Energy Limited. The market is regulated by the Electricity Regulatory Authority, established in 1999. Thanks to the 2013–2014 reform of feed-in-tariffs, private companies have been playing an increasingly significant role in the national market for capacity additions, mainly in biomass and small and medium hydro. However, it must be noted that owing to grid capacity constraints and burdensome processes of grid connection, projects have often exhibited long lead times before their effective on-lining. The standalone PV market has also steadily grown over the last decade, with new players, including foreign investors, entering the market. Policy measures such as tax exemptions for equipment for solar and wind generation and subsidies for end-users have also supported expansion of the sector, thus contributing to producing a fairly competitive market. In South Africa the public utility Eskom is responsible for 95% of the electricity consumed, determining a de-facto monopoly in the generation market. Furthermore, all the remaining small IPPs (which have begun entering the market mostly with RE projects in the framework of the auction programme which entered into force in 2011 to replace FiTs) resell their power directly to Eskom, creating a monopsony market situation. Eskom is currently also responsible for transmission and distribution, determining no unbundling of the power sector. Power off-take risk for independent generators has thus been defined risky by Climatescope (2017). In the prospect of shifting away from coal (currently accounting for the bulk of total generation), the government has agreed upon a plan of gas-RE tandem, which will necessarily imply the deployment of large-scale CSP, PV parks, and wind farms. Thus, the successful implementation of the Renewable Energy Independent Power Producer Procurement (REIPPP) Programme will certainly require greater private-sector engagement and the accomplishment of a more competitive generation market over the next decades. As far as decentralised solutions are concerned, mini-grids have been regulated since 2006 by the Electricity Regulation Act, but in the South African context, characterised by a high electrification rate and by the large extension of the national grid, they have only been meaningful in very remote rural communities. On the demand-side, one of the key mission for policymakers is to find the proper financial solutions to lower connection charges and expand access to grid electricity, or create supportive policy for the uptake of decentralised solutions. Golumbeanu and Barnes (2013) highlight that, from the household’s perspective, potentially accessible energy (for instance as a result of an extension of the national grid or of the opportunity to install a small PV) does not automatically imply actual access (see evidence from rural Kenya by Lee et al. 2016). In the case of on-grid connections, where potential customers must decide whether to connect to the network, up-front charges are the greatest barrier, while service provision costs are much more modest. The (IEA 2011) showed that there is indeed a strong inverse linkage between connection charges and national electrification rates in Sub-Saharan Africa, determining a determination coefficient of 0.85 when controlling for GDP. Minimum reported connection charges are the following in selected EA-7 countries (Golumbeanu and Barnes 2013 and other online sources): Kenya 400 USD (for single-phase, domestic customers within 600 meters of an existing transformer), Rwanda 350 USD, Tanzania 297 USD, Uganda 125 USD (single-phase, no-pole service, tax included). In some way, the same issue also applies to off-grid RE solutions, where purchasing and installing the devices are the only costs faced, since generation is then free of charge (besides maintenance). As a result, the question of how to lower upfront costs seems like a most compelling one for policymakers, because it represents the key barrier to the solution of a loss-loss situation for both electricity supply companies, private providers, and potential customers. Thus, questions of private-public financing (e.g. of how large subsidies should be and which schemes they should follow), as well as bureaucracy involved, supply reliability, and behavioural considerations are all to be considered. Both payment schemes and public subsidies are pivotal in this sense. There are in fact different ways to lower up-front costs for households, such as directly subsidizing some of the connection charge; incorporating part or all of the charge into the electricity tariff; financing the charge through an external bank institution; or allowing consumers to pay the connection charge over time through credit schemes provided by the utility (including new instantaneous payment solutions enabled by digital technologies). 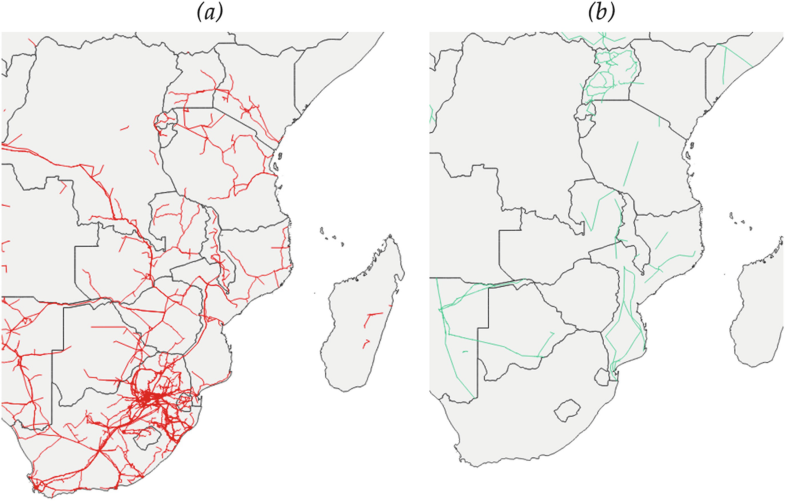 Bernard and Torero (2015) estimated the effect of distributing discount vouchers on the demand for connections in Ethiopia, and found that the demand is very responsive, remarking that connection fees represent a very significant barrier to electricity adoption. An adequate and effective implementing agency, able to operate autonomously from political pressure and being accountable through a priori established targets and measurable parameters must be in place. The electrification plan should be designed so as to be appropriate to the real needs and financial commitment possibilities of individuals, while also ensuring that other prior necessary conditions for its achievement are being met. A sound tariff policy which guarantees the financial sustainability and cost recovery of infrastructure development schemes, and thus that considers the actual measured ability-to-pay of households, must be established, rather than a politically agreed-upon figure. Group-based subsidies, linked to number of applicants so to create a critical mass of customers and foster positive network and scale externalities, could also have a positive impact in contexts of relative poverty. On the other hand, electricity utilities should make the effort of unilaterally lowering their connection-related costs (and thus the derived consumer charges) by e.g. decreasing their material and management costs and adjusting technical standards to reflect the actual amount of electricity planned to be used by each household. The key idea is that public policy is a pivotal determinant of demand-side outcomes for energy access, while energy companies can also be flexible in changing their business models so as to unlock loss-loss traps. Besides subsidies, energy access entails different additional policy dimensions, such as the need for a coordination plan (in particular in the context of rural areas), and the establishment of standardised PPAs to foster local private companies’ investment in decentralised power infrastructure. Table 5.7 summarises the country-by-country situation for some of the key electrification policy frameworks. To start with, a rural electrification plan is found virtually in every country. In Burundi the Vision Burundi 2025 plan has been approved in 2011, and the national objective is that of achieving an electrification rate of 25% by 2025. To accomplish this, Burundi has adopted a Decentralized Rural Electrification Strategy in 2015. However, the plan does not include specific objectives and clear supporting policy measures, but it rather represents a governmental vision. In Kenya, two plans have been set forth: the Rural Electrification Master Plan and the Distribution Master Plan. The former sets the objective of achieving a 65% access to electricity by 2022 and full access by 2030. Clear steps and supporting instruments are defined. The Rural Electrification Authority is the main authority responsible for tracking progress of the plan. The latter, put forward in 2013, produced estimates of the long-term annual investment required in all distribution infrastructure, from 66 kV to LV, up to 2030. In Malawi, the Malawi Rural Electrification Program (MAREP) was last updated in 2017 and is currently undergoing its eight phase since its inception in 1980. It is supported by the Malawi Energy Regulatory Authority (MERA) and Rural Electrification Management Committee. Phase 8 foresees connecting to the grid 336 new trading centres by the end of 2018, along with generation capacity additions. In Mozambique at the end of 2017 a $500 million electrification program based on hydro, solar, micro-grids was launched by FUNAE. It aims at powering 332 villages through hydropower mini-grids with a combined capacity of about 1.01 GW and implementing 343 solar PV projects. Rwanda’s Ministry of Infrastructure put forward in 2009 its Electricity Access Roll Out Program, which is being implemented by the national Rwanda Energy Group. This has been supported by 377 million USD in its first stage, which successfully increased electricity connection by 250,000 units in just 4 years. The second phase is currently ongoing, and it is being backed up by 300 million USD to achieve a 70% electrification rate. Tanzania’s Power System Master Plan was last updated in 2016, has a planning horizon of up to 2040, and is being followed by TANESCO and EWURA. It suggests a 46 billion USD implementation cost and aims to boost power generation capacity to 10GW over the next decade. The government wants in fact to boost the electrification rate to 90% by 2035. Uganda approved its Indicative Rural Electrification Master Plan in 2009, which has been developed to reflect various alternatives of future network extensions, taking into account any planning for future transmission lines, sub-stations and distribution networks, industrial projects and international power exchange projects. The IREMP outlines guidelines, describes preferred standards and the phased implementation of future rural electrification in Uganda, as well as giving estimations of costs. It is intended that the IREMP act as a catalyst for the implementation of rural electrification projects. In 2015 a Grid Development Plan was also put forward to cover a period of 15 years and identify and justify new grid investments. It is reviewed and updated annually to reflect latest information on Government policy and strategies. It is also an input to the company’s financial projections and annual budget. Finally, South Africa in 2013 approved its New Household Electrification Strategy (NHES), which replaced the Integrated National Electrification Programme (INEP). The NHES agreed upon defining universal access as 97% of households, as full electrification is unlikely to be possible due to growth and delays in the process of formalising informal settlements. 90% of households should be electrified through grid connection, while the rest with high-quality non-grid solar home systems or other possible technologies based on cost effective options in order to address current and future backlogs. The development of a master plan to increase efficiency in planning and the delivery process to ensure more connections is also expected. As of March 2018, the progress over the plan’s objective stand at 84% for grid connections and at 66% for non-grid solutions. As far as the situation of standardised PPAs for off-grid (in particular mini-grid) power generation is concerned, countries where standardised agreements for off-grid power purchase are offered include Tanzania, Uganda (where contracts also have sufficient duration and purchase obligation), while in Malawi, Rwanda and Kenya PPAs are in place but in a weaker form, and in Burundi and Mozambique they are completely missing from the national energy policy. Finally, while subsidies on the unit price of electricity for residential consumers are virtually in place in all countries, subsidies to lower grid connection barriers (e.g. loans for low-income families or direct subsidies for rural customers) are in place in Kenya, Rwanda, Tanzania, and Uganda. Post-connection, feed-in-tariffs (Table 5.8) can be a further beneficial policy instrument in increasing private investment (from the scale of individual households and communities up to large companies), as they pay back the electricity-generating infrastructure owner who performed the upfront investment. However, if poorly set or managed, FiTs could also distort the market. In fact, they represent at the same time one of the most expensive way to subsidize RE and the single policy instrument that in many instances led to the quickest deployment. Thus, tariffs must be set in place appropriately, i.e. considering their burden on public finances, and adapted from time to time to keep up with changing socio-economic circumstances. On this point, Cox and Esterly (2016) remarked how conventionally FiTs for renewables have been set as fixed (e.g. per kWh produced), while in order to align with specific policy goals, policymakers should also consider varying FiTs payments by technology, project size, location and resource quality, as it is the case of Uganda’s GET FiT program. In Kenya FIT policy was adopted in March 2008 and revised first in January 2010 and then again in December 2012. The policy covers biogas, biomass, geothermal, small-hydro, solar and wind. Tariff differentiation is technology specific as well as size specific (below or above 10 MW). Hitherto, the policy has resulted in three IPP projects in Kenya, including a 29 MW biomass generator, a 40 MW geothermal project, and a small hydro site. On average, FiTs in Kenya payed 0.09-0.10 USD/kWh. Uganda’s initial FIT policy was developed in 2007, under the Renewable Energy Policy on 2007. It was applicable up to 2009 and is referred to as REFIT phase 1. However, very limited uptake by developers was witnessed during the initial 3-year period. As a result, the policy was revised in 2012 and new tariffs were developed based on updated levelized costs of production so as to fast-track 20-25 small-scale renewable projects with a target capacity of 150 MW. The scheme, known as GET FiT, originally focused only on small hydro, bagasse (mostly sugarcane waste) and other biomass. In 2014, solar PV was included in the list of eligible technologies. To encourage participation, developers benefited from a top-up on the existing feed-in tariff and standardisation of PPAs and the development process. By the end of 2015, 17 GET FiT projects had been approved for 20 MW of biomass, 117 MW of small hydro and 20 MW of solar PV, with the first solar project commissioned in 2017, and others to follow in 2018. Currently GET FiT is under its third phase and it will offer support for up to 295 MW of hydro, bagasse and wind projects. Challenges remain to bring these projects online, as grid capacity is constrained and connections to the grid suffer from delays. In 2012, the Malawi Energy Regulatory Authority (MERA) drafted a feed-in tariff plan including small scale hydro (between 0.5 and 10 MW), PV, biomass, wind, and geothermal. For instance, for the case of hydro the tariffs apply for 20 years from the date of the first commissioning of the plant and they range between 0.08 and 0.14 USD/kWh depending on the project’s scale and on the nature of the investor (firms or individuals), while for PV generation the FiT stands at 0.20 USD/kWh, for biomass and geothermal at 0.10 USD/kWh, and for wind at 0.13 USD/kWh. The policy also states that the FiTs shall be subject to review every 5 years from the date of publication. Any changes that may be made during such reviews shall only apply to RESE power plants that shall be developed after the revised guidelines are published. Decree 58/2014 created Mozambique’s feed-in tariff, which applies to biomass, wind, small hydro and solar projects from 10 kW to 10 MW. Prices vary according to technology and capacity (ranging between 0.07 USD/kWh for large biomass projects up to 0.22 USD/kWh for solar PV up to 10 kW). According to this Decree, all projects must sell electricity to the state-owned utility EDM. Although the decree is available, injection of power into the grid cannot happen yet as some regulation is still to be approved. However, as of mid-2017, the FiT mechanism was already under revision. Mozambique is also reviewing the scope of the National Electricity Council (CNELEC), the power market regulator, in order to broaden and strengthen its role. While this might help FiT mechanism to gain more space in Mozambique power market, however, the mechanism still has a long road ahead to be fully in force, since EDM, the only off-taker of all power contracts, is under considerable financial strain. Rwanda’s Renewable Energy Feed-in tariff regulation was promulgated in February 2012. The Rwanda tariffs apply to small hydro from 50 kW to 10 MW. Contract terms are only 3 years and the law specifies that the tariffs cannot be reduced, while they are subject to a revision in the second year of the program to be implemented during the third year. Electricity tariffs are relatively high in Rwanda; however, a FIT policy is important to guarantee investors in renewable sources a ready market and an attractive return on investment for the electricity they produce. The FIT policy is still relatively new, but it has attracted the interest of RE developers. In Tanzania there are currently no FiTs in force. In 2014 a study has been commissioned by the Energy and Water Utilities Regulatory Authority (EWURA), as part of its collaboration with the US “Power Africa” scheme. However, as of late 2018 no regulation has been passed. To conclude, the case of South Africa’s is of particular interest because it provides a relevant example to policymakers in EA countries of the kind of problems which might arise from the introduction of FiTs, as well as why shifting to a competitive tendering procurement process might be an effective alternative. South Africa approved RE-FiTs in 2009. They were designed not only to cover generation costs, but also to provide a real, after tax, fully indexed for inflation return on equity of 17%. Tariffs were initially particularly high, offering 0.156 USD/kWh for wind, 0.26 USD/kWh for solar PV, and 0.49 USD/kWh for solar CSP. After 2 years, the national regulator NERSA called for lower feed-in tariffs, arguing that a number of parameters, such as exchange rates and the cost of debt had changed. Tariffs were then adjusted downward, up to −41% for PV projects. At the same time, the Department of Energy and National Treasury concluded that the FiTs amounted to non-competitive procurement, and therefore were infringing public finance and procurement regulations. After several rounds of discussion and consultation, in 2011, the Department of Energy announced that the Renewable Energy Independent Power Procurement Program, a competitive bidding process for RE, would be launched, while NERSA officially abolished the RE-FiTs. During the 2 years of FiTs no PPA was signed, no procurement process was implemented, and the required contracts were never negotiated or signed. Competitive tenders introduced by the new regulation initially envisioned the procurement of 3.6 GW over up to five tender rounds, with a group of international and local experts assessing the bids. Over the four bidding rounds, USD 19 billion have been invested in 92 projects totalling 6.3 GW. As commented by Eberhard and Kåberger (2016), the competitive bidding process lead to increased competition (with record lows of 0.047 USD/kWh for wind and 0.064 USD/kWh for solar PV), and this was the main driver for steadily falling prices over the bidding rounds. At the same time transaction costs kept falling in subsequent rounds, as the project sponsors and lenders became familiar with the REIPPPP tender specifications and process. Finally, progressive tariffs,3 lifeline tariffs,4 microcredit and smart payment options via mobile phones all represent additional options with a strong potential to overcome the inability-to-pay. Governmental actions and plans for energy development should in fact also be drawing insights from research at the intersection between energy and behavioural economics (Spalding-Fecher et al. 2002; Pollitt and Shaorshadze 2011; Frederiks et al. 2015), so as to tackle some common issues such as split incentives; stalemate loss-loss situations; questions relating to energy efficiency; behavioural lock-ins; and thus nudge (Sunstein and Thaler 2008) individuals towards better energy decisions. It is important to remark that finding effective and secure payment and incentives solutions also has a feedback effect on the supply side because it fosters investments in capacity additions and grid infrastructure development from the private sector. Energy policy (in particular for mini-grid projects) should also be tightly linked with support schemes to local entrepreneurship: a coordination of the two could provide the chance for promoting productive energy uses even in remote rural areas, and thus pave the way out of energy-poverty traps. In this sense, an emerging aspect deserving attention is the role that digital technologies are already playing in fostering energy development in the region. EA is indeed the first region in Africa for mobile-based services usage (WRI 2017). Mobile phones have rapidly spread as devices serving a multitude of functions beyond interpersonal communication, such as money transfer, bills payment, or access to bank services. Excluding South Africa, between 2005 and 2016 mobile phone subscriptions per 100 people in EA countries grew from an average of 5.7 to 60.7 (World Bank data), i.e. they witnessed an 11-fold multiplication (see Fig. 5.12). Considering the population growth pace and the large share of very young people in the EA, such trend seems even more dramatic. In the last few years mobile phones have also gained increasing relevance for their potential breakthrough impact on different dimensions of energy access, including infrastructure planning and its operations, new business models, payments schemes, monitoring, data collection, and analysis. For instance, pay-as-you-go mechanisms are emerging as successful approaches to enable access in peri-urban and rural areas where investment was previously seen as both too costly by the demand-side and too risky by the supply-side. These systems allow households to rent the use of power generation infrastructure when they need energy, without having to purchase it ex ante with large upfront investments, or to purchase it in weekly or monthly instalments with variable leasing length while already benefitting from it. Payments become easy and immediate thanks to mobile phone networks (which in SSA are often found even in areas where the electricity grid is absent), and monitoring consumption levels and accepting payments hence turn into an inexpensive and transparent task for private providers. QR code-based application allowing to accept payments from customers’ mobile phone without using point of sales machines, and thus further cutting on costs, are also being piloted. For example, Off Grid Electric’s customers pay approximately $6 per month for entry-level systems, and $15–20 per month for small business kits that include various appliances. Hitherto, much of the pay-as-you-go solar power innovations have focused on EA, and primarily Kenya. This is partly because of the popularity of mobile money in the region. Among the larger companies in the sector, there figure Off-Grid Electric, d.Light, Bboxx, Mobisol, Nova Lumos and M-Kopa Solar. Collectively, these have raised in excess of 360 million USD and they deployed more than 100,000 solar systems across the continent. They rely on IT systems—including web platforms, mobile apps and two-way SMS—to communicate with their customers and to manage power provisioning devices access and operations. On the other hand, pay as-you-go entrepreneurs still represent an oligopoly, with just 4-5 companies active in the largest markets (Tanzania and Kenya), most of which are owned, managed and financed by foreign investor. In particular, WRI (2017) found 52 foreign private sector organizations backing such companies. This is partially due to the fact that local commercial banks are not willing to lend to local business because of the perceived risks of such new business models, and, as a result, local entrepreneurs struggle to access the capital they need to get started. In this sense, public finance from development finance institutions could unlock the situation and enable a larger competition field in the market, with a win-win for customers, electrification targets progress, and the local economy. However, given the myriad of potential business plans and solutions that can be offered, companies should be addressed by supporting policy so as to maximise impact. These include payment schemes that foresee per-hour consumption costs, weekly flat tariffs with or without suspension and fines in case of discontinued payment. Randomized evaluation tests are undergoing (e.g. see Jack and Suri 2014) with the precise objective of finding out how price and payment methods affect the adoption of off-grid power-generation devices. Furthermore, a capillary data collection of consumption patterns allows public institutions to carry out of improved analysis to tailor additional investment and analyse expansion opportunities, paving the way for greater private-sector involvement in the market. The results of our analysis suggest that the average required capacity investment for matching demand growth beyond electrification ($80 billion)—is around the same of that needed for new electrification itself ($87 billion for a mean level between low, $61 billion, and high-tier, $113 billion, consumption). Therefore, total investment cost for power generation, transmission, and distribution will amount to around $167 billion dollars between 2015 and 2030. Concerning the average investment required each year between 2016 and 2030, the figure corresponds roughly to $42.5/capita for the current EA population, or 2.6% of EA-7’s GDP in weighted terms. International public finance institutions, such as multilateral development banks and national development agencies, could channel international private investments into Africa’s power sector by putting in place dedicated blended finance tools and/or risk-sharing mechanisms. In fact, the combination of political risks (e.g. corruption), commercial risks (e.g. solvability of consumers), lack of stable power market regulatory frameworks and lack of adequate power infrastructure, prevent international private investors from scaling-up investments in the continent. International official development assistance (ODA) and other official flows (OOF) to the African power sector have tripled over the last decade, increasing from $2 billion in 2005 to $8 billion in 2015. The World Bank Group (WBG), the European Union (EU) (i.e. EU institutions + EU Member States) and the African Development Bank (AfDB) disbursed most of the funds in the sector, while actors like the United States (US), the Climate Investment Funds (CIF), the Arab Fund for Economic and Social Development (AFESD), the OPEC Fund for International Development (OPEC-FID) and others played a far minor role. About 90% of the last decade’s international financial support to Africa’s electrification came from only three players: WBG, AfDB, EU. In terms of sectorial destination, the WBG mainly invested in non-renewable power generation (particularly coal), while the EU mainly invested in renewable power generation (namely hydro, wind and solar). On its side, the AfDB mainly invested in power transmission and distribution infrastructure. It is also worthwhile to outline the geographical distribution of the various players’ investments. 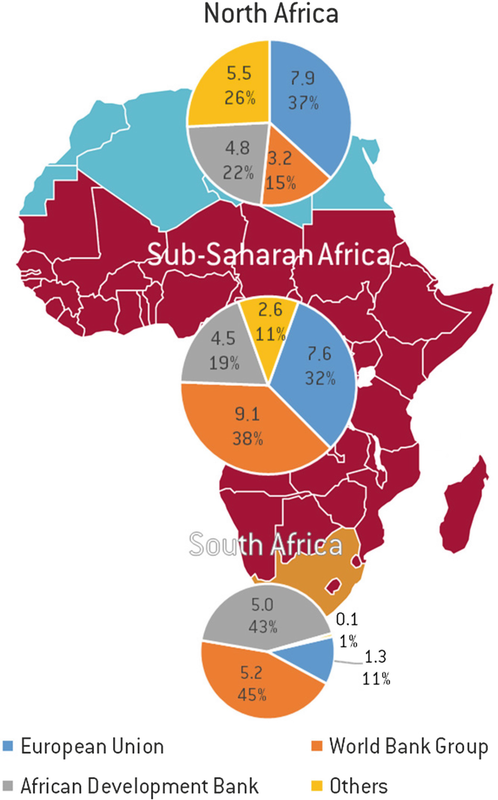 The WBG and the EU are key players in sub-Saharan Africa (excluding South Africa), while the AfDB is the key player in South Africa (Fig. 5.13). On their side, Chinese companies (90% of which state-owned) have also heavily invested into Africa’s power sector. About 30% of new power capacity additions in sub-Saharan Africa between 2010 and 2015 was indeed financed by China, for a total investment about of around $13 billion over the quinquennium. Chinese contractors have built or are contracted to build 17 GW of power generation capacity in sub-Saharan Africa from 2010 to 2020, equivalent to 10% of the existing installed capacity in the region. In geographical terms, these projects are widespread across the region, and concerns at least 37 countries out of 54. In terms of capacity size, Chinese contractors primarily focus on large projects. In terms of type of capacity, they primarily focus on traditional forms of energy like hydropower (49% of projects 2010–2020), coal (20%) and gas (19%), while involvement in modern renewables remains marginal (7%). Over the last years, to maximise impact and leverage on private investors, the WBG and the AfDB have streamlined their actions in the field, focusing resources on a few initiatives. The WBG operates through its established mechanisms (i.e., The International Bank for Reconstruction and Development, The International Development Association, The International Finance Corporation, The Multilateral Investment Guarantee Agency). The AfDB, in addition to its traditional financing tools, has established two initiatives to invest in Africa’s (electricity) infrastructure: the ‘New Deal on Energy for Africa’ and the ‘Africa50’. The former is a public-private partnership between the AfDB, African governments and global private sector aimed at putting in place innovative financing to achieve universal access to energy by 2025, while the latter is an infrastructure fund owned by the AfDB, African governments and global institutional investors created to specifically mobilize long term savings to promote (electricity) infrastructure development in Africa. On the contrary, the EU’s action appears to be particularly fragmented. The EU has 26 initiatives ongoing in the field, originating from either EU Member States or EU Institutions. The variety of EU Member States’ initiatives is understandable, as each country has its own political and commercial interests to promote across Africa. What is less understandable is the fragmentation of EU Institutions. The EU’s current fragmented system seems to favour overlaps, inefficiencies and overall higher transaction costs. It is reasonable to consider that European taxpayers’ money would be far better spent if channelled through a unique facility, allowing policy consistency, elimination of overlaps, abatement of transaction costs and, therefore, overall higher efficiency and impact. This could be done by coordinating current and prospective EU programs though the recently-established ‘EU External Investment Fund’. For example, the availability of water for the cooling of thermal power plants or possible hydropower disruptions in areas prone to suffer from drought events. The New Policies Scenario “takes account of broad policy commitments and plans that have been announced by countries, including national pledges to reduce greenhouse-gas emissions and plans to phase out fossil-energy subsidies, even if the measures to implement these commitments have yet to be identified or announced” (IEA 2017a). Progressive tariffs result in a higher unit cost/kWh to customers who consume more electricity, so as to favour poorer household and encourage the fulfilment of most basic needs. Under lifeline tariffs, richer consumers cross-subsidise with their bills households that cannot afford to pay the market price of electricity.